The Ludwig Raw Brass brings the classic Black Beauty sound with a new look guaranteed to get attention. The Ludwig Black Beauty snare drum is one of the most iconic snare drums of our time. It's distinctive look and sound have graced countless records, homes, and music venues for decades. The Raw Brass continues this tradition with a new look and finish. 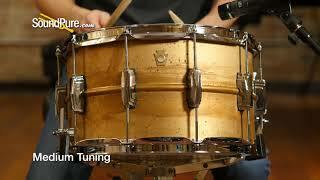 The Raw Brass' sound comes from a single sheet of brass that is machine drawn and spun into a seamless beaded drum. This time-consuming process creates incredible sonic results worth the time and attention and makes the competition sound thin and anemic by comparison. The thin 1mm brass shell creates a crisp and full-bodied note that we love throughout a diverse range of tuning allowing these drums to be right at home in a variety of musical applications. Each brass shell is treated with a patina style finish making each drum a unique item. The Raw Brass comes in a variety of sizes and hardware options that can help you find your signature look and sound. Discover for yourself why so many have reached for the Ludwig as their go-to drum today. In this video, Sound Pure drum specialist Barry Knain describes and demonstrates the Ludwig 8x14 Raw Brass Phonic Snare Drum. The new raw brass features an un-plated 1mm brass shell to achieve a very unique “earthy” look. Everything you love about a Black Beauty with just enough dry response and an unforgettable look. These shells do not receive a sealer coat so it will oxidize even further as time goes on. This process makes each one truly have an identity of its own!